JST SM type Black connector w/ wing clips - fits Wattage Praxus, Magic Machine & more. This connector typically is ON the battery pack. Includes wire leads that are about 4" long. MFG part # SMP-02V-BC. Also known as JST SM, JST 2.54. RC 12" extension - choose Futaba J style or JR-HiTEC-Airtr.Z style. 22-gauge 3-color wire. RC 18" extension - connector at both ends. Choose Futaba style, or JR-HiTEC-Airt.Z style. Double-ended 18" RC extension with 3-color 22-gauge wire. Choose connnector brand-color style: Futaba J (black red white), or JR-HiTEC-Airt.Z (orange red brown). EC3 connector set: Pkg has 2 blue mating housings & 4 Gold-plated mating connector pins. Note: The connector that goes on a Battery pack is the one with the narrower blue tips. TRAXXAS Connector set - one housing w/ Gold-plated Pins for Battery, and one housing w/ Gold-plated pins for Motor/Charger. Pins can be soldered onto. RC 24" extension - has connector at both ends. Choose Futaba J style or JR-HiTEC-Airt.Z style. Double-ended 24" RC extension with 3-color 22-gauge wire. Choose Futaba J style (black red white), or choose JR-HiTEC-Airt.Z style (orange red brown). KM-KM : Kyosho Male conn. to Kyosho Male conn.
Tamiya Female connector to Tamiya Female connector. RC adapter. 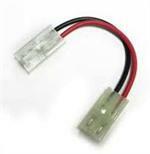 Kyosho male to Tamiya female : RC adaptive connector for motor batteries. Assembled in U.S.A. by BATTERIES AMERICA. 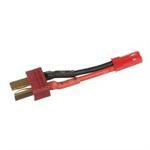 TM-UF : Tamiya male to red Ultra female adaptive connector - for RC hobby motor batteries. Assembled in U.S.A. by BATTERIES AMERICA. TM-KF : Tamiya male to Kyosho female adaptive connector - for RC hobby. Assembled in U.S.A. by BATTERIES AMERICA. TF-UM : Tamiya female to Ultra male adaptive connector - for RC hobby motor batteries. TF-UM : Tamiya female to Ultra male adaptive connector - for RC hobby motor batteries. Assembled in U.S.A. by BATTERIES AMERICA. 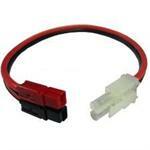 TF-BP : Tamiya female to 4mm Banana plug adaptive connector - for RC hobby motor batteries. KM-TRF : Kyosho male to Traxxas female adaptive connector - for RC hobby motor batteries. KF-TRM : Kyosho female to Traxxas male adaptive connector - for RC hobby motor batteries. JSTF-BP : JST female connector to Banana Plugs. Use this adapter to attach battery packs with JST connector to a charger (or to a motor with Banana plug receptacles). UM-JSTM : Adapter to convert battery with Ultra conn. to red JST conn.
JSTF-UF : Adapter to convert battery with JST conn. to red Ultra conn.
Y-Connector, 11" long. Made with 3-color 22-gauge wire. Choose Futaba style (red, black, white) or SPEkTRUM-JR-HiTEC-Z style (red, brown, orange). Length = 11 inches. 18 Gauge Silicone Wire Pkg: 5 feet Red & 5 feet Black. High-Strand-count copper wire, with Silicone insulation. EC3 Blue battery connector, pre-wired with 8" of heavy 13-gauge red & black wires. EC3 charger/motor connector with 8" of heavy-gauge red & black wires. Hand-assembled in the USA. JR-HiTEC-SPEKTRUM adaptor connector - hooks up to IC-14V charger. JR-style Female connector at one end (plug your JR, HiTEC, and Airtronics Z receiver battery into it); other ends plugs into IC-14V. Enables fast-smart charging of battery pack w/ IC-14V. Standard-size Switch Harness with 2-color 22-gauge wire, 2 male & 1 female conn (choice of Connector Brand). Available with Futaba J connectors, or JR-HiTEC-Airt.Z connectors, or old-style AIRTRONICS. 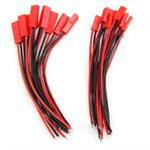 16 Gauge Silicone Wire Pkg: 5 feet Red & 5 feet Black. High-Strand-count copper wire, with Silicone insulation. Genuine Deans brand 3-pin black connector set (SET = 2 pcs). Mating connectors; 1 for Battery pack, 1 for motor/charger. Sold in factory-sealed bag sets. Highest quality connector, for small-to-mid size amperage motor applications. 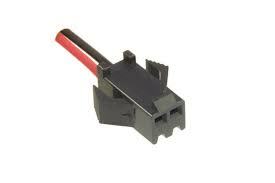 TM-PP : Tamiya male to PowerPole adaptive connector - for RC hobby motor batteries. Assembled in U.S.A. by BATTERIES AMERICA. 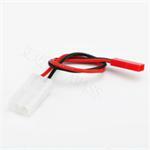 14 Gauge Silicone Wire Pkg: 5 feet Red & 5 feet Black. High-Strand-count copper wire, with Silicone insulation. 13 Gauge Silicone Wire Pkg: 5 feet Red & 5 feet Black. High-Strand-count copper wire, with Silicone insulation. 6JSTF-BP : JST multi-charge adapter to banana plug. Attach up to 6 battery packs (with JST conn.) at a time; plug other end into charger. AR-CGA : Adapter Plate for Balance-Charging the Parrot AR Drone 2.0 batteries. Heavy Switch Harness, soft-mount style, with charge jack mounted on surface. Includes mounting Hardware. No LEDs on this model. Choose (1)Futaba, or (2)JR-HiTEC-Z. Priced @ $14.95 ea.